On July 11, a Red-shouldered Hawk soared into the trees at Turkey Run Park, as an excited crowd of about forty fans––including ARMN members––watched and applauded and four local TV news channels filmed the release. The bird’s journey to that moment began one evening in early April, when Mark Stein was walking his dog in the woods at Turkey Run. He noticed a large bird on the ground near the path and was concerned enough to go back the next morning to check on the bird, which was still there. He called the National Park Service Police and stayed with the injured bird until the park police arrived, along with National Park Service (NPS) Biologist and ARMN friend Erik Oberg, to capture the hawk and transport it to Raptor Conservancy of Virginia for recovery and rehabilitation. At the Raptor Conservancy center, the adult hawk was treated for its injuries and fed. Once it was medically stable, it was put into a large flight cage to regain its strength for flying––and eventually, hunting. Before the rehabilitated bird was released, Oberg introduced Mark, the Good Samaritan, who seemed pleased to see the results of his intervention, though slightly embarrassed by the attention, especially from the TV reporters with their notebooks, microphones, and cameras. 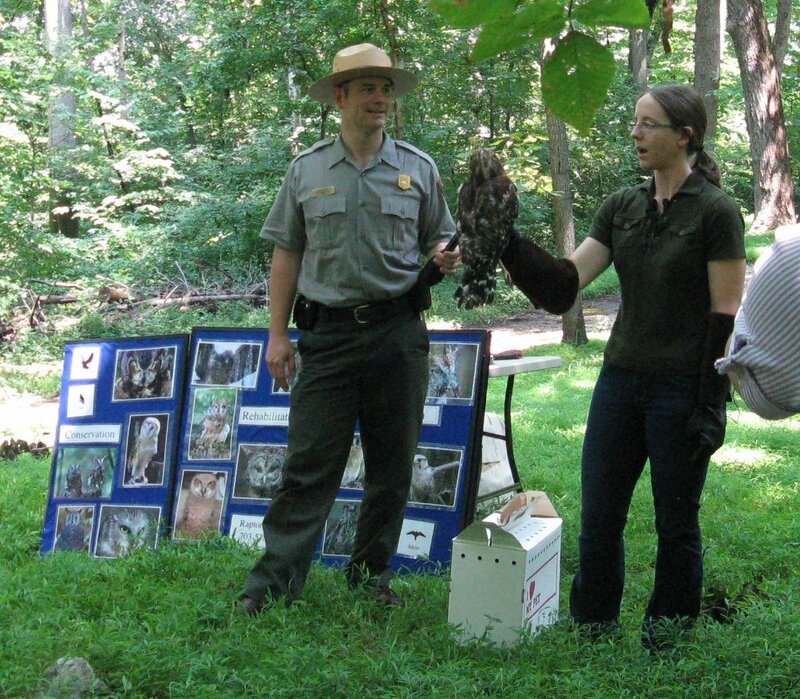 As songbirds in the trees loudly signaled their distress, Gabby Hrycyshyn of the Raptor Conservancy of Virginia displayed a flightless Red-shoulder, trained as an education bird, and explained the important role raptors play in local ecology. When the moment arrived just after noon, Gabby removed the rehabbed hawk from its cardboard pet carrier, held it for a moment while the TV cameras rolled, and then gently tossed the bird aloft. It knew just what to do and soared immediately into the woods, perching on a high branch just long enough to look back over a red shoulder at its admirers before returning home. This entry was posted in Events, News by howellch. Bookmark the permalink.